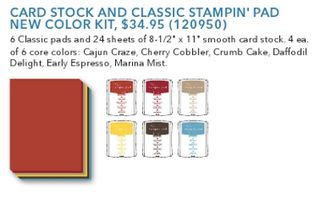 With this year’s color renovation, Stampin' Up! came out with kits to update your existing products to the new color groups. 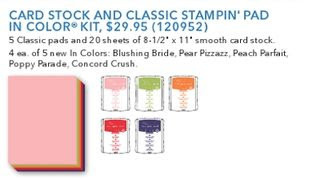 In the case of the markers, pastels, and Watercolor Wonder Crayons, you can purchase a kit that will give you just the newly added colors so you don’t have to buy the entire set again. 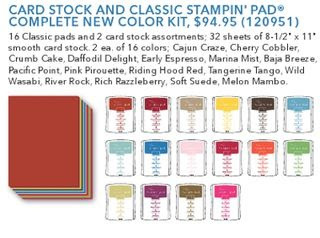 Plus they will include a new insert so you will know where your new colors go. It was so easy to change up my markers! 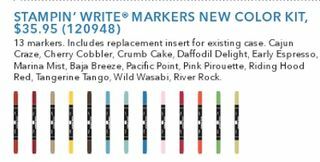 PLEASE NOTE- the Pastel and Watercolor Wonder Crayon kits are currently not available. There were some quality issues and Stampin’ Up! doesn’t want to send out an inferior product. While sometimes the delay is frustrating, I really appreciate their attention to detail and I’ve found that it’s well worth it to wait for the “right stuff”! If you would like to order any of these, please visit my online shopping store. Just click on “shop now” and have fun! Of course, if you have ANY questions, just let me know!